Makes two 6" long, 1.25" thick waffle boats for filling with fruit ice cream and toppings. Seven setting Waffle Browning Control. 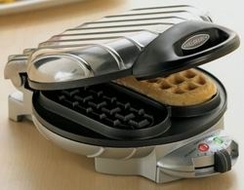 Waffle-Tone alert sounds when waffles are finished baking. Ready light tells you when to start baking and when waffles are done. Waffle and pancake batter recipes included.